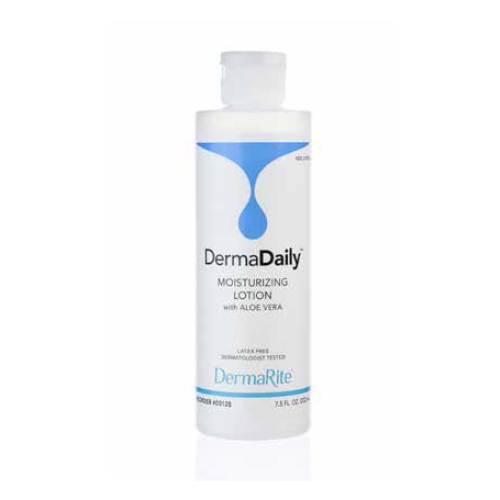 DermaDaily is a Moisturizing Hand & Body Lotion that enriches the skin's own natural oils. DermaDaily contains Aloe Vera to aid dry skin and is designed to be used on hands, face and the body. Manufactured by Dermarite, DermaDaily provides long lasting skin protection. Dermarite DermaDaily Moisturizing Hand & Body Lotion is a fast acting Skin Lotion that provides deep penetration for dry skin relief. DermaDaily Moisturizing Hand & Body Lotion is non-greasy and is available in a 4 ounce squeeze bottle, a 7.5 ounce squeeze bottle, a 1 gallon jug or a 1000 mL jug. DermaDaily Hand & Body Lotion is comparable to Beirsdorf-Jobst – Jobst Eucerin Lotion™. Soft and mild hand and body lotion. Provides deep penetrating dry skin relief. Enriches the skin’s own natural oils. Dermarite DermaDaily Moisturizing Hand & Body Lotion Product Numbers: 00124, 00128, 00135, 00122BB. Size Options: 4 ounce squeeze bottle or 7.5 ounce squeeze bottle, 1 gallon jug, or 1000 mL jug. Comparable to Beirsdorf-Jobst – Jobst Eucerin Lotion. DermaCerin Moisturizing Hand & Body Lotion MSDS. DermaDaily Moisturizing Lotion is great for hands. My dry skin feels so much better when it get its daily dose of this lotion.